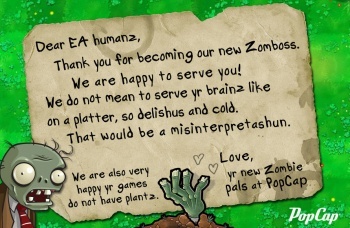 It didn't have to, but EA decided to go into debt rather than just use the cash on hand to buy PopCap. PopCap's recent purchase by EA was some pretty big news, partially because the casual developer is going to stay autonomous under the deal and partially because EA spent so much money to acquire it. In fact, it turns out that EA actually went into debt for the purchase. It's been revealed that EA priced $550 million in convertible debt in a private placement. Basically, the publisher is borrowing money to help fund part of its purchase of the developer. The debt will be placed in the form of senior notes that will come due in 2016. The notes will be convertible into cash and EA's common stock (purchasers will receive 31.5075 shares of stock per $1,000). This is actually pretty interesting, since EA has approximately $2 billion in cash on hand. The purchase of PopCap will ultimately cost EA somewhere between $750 million and $1.3 billion, so it's not like the company didn't have the cash to just buy the company outright, free of debt. That means that EA might actually have other uses for the cash, though exactly what its plans are for the money remains to be seen.